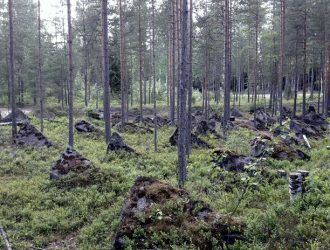 Kauniainen is Finland’s smallest municipality, only 6km2 (2,3mi2) in diameter, located in the middle of another municipality, Espoo. 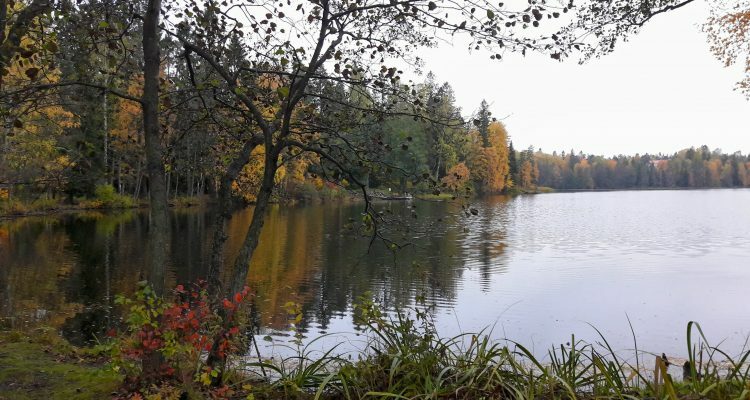 It has a lovely small lake area that is perfectly suitable for a lazy stroll to enjoy the absolutely huge spruce trees and leafy green oak trees. 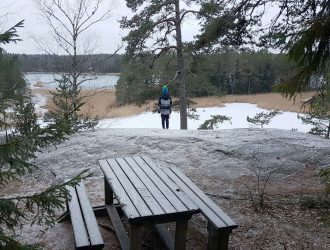 The area is only about 15km from the centre of Helsinki and easily accessible by car or by public transport, so a perfect place for a quick relaxing visit. My friend and I were in the area when we, quite literally, turned a corner and almost ended up in a lake. The lake surface was dead calm, and the branches of beautiful weeping willows were skimming the lake. We noticed a lovely path following the lake, just begging us to take a walk, so we decided to follow its call. Leaves quietly swooshing, birds cooing, and the satisfying crunch of the pebbles under your feet. We stopped by a pier to overlook the lake, tipping the toes of our shoes in the lake. The path winds down past beautiful century-old art nouveau villas, which are historically and culturally very special. Walking around lake on the the 1km path is best done quietly, enjoying the massive old trees. It is easy to understand why this area has drawn in wealthy people who built villas overlooking the lake: it breathes calmness and piece of mind. Address: Lindstedtintie 1, Kauniainen. This address has a tiny place where you can park your car for a short while. 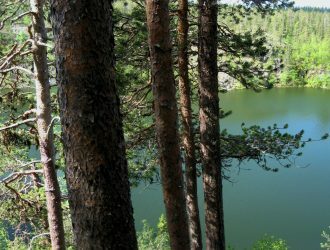 How to get there: You can get to Gallträsk lake by car, by public transport, or by bicycle. Car: Just follow the instructions of your navigator. The drive from Helsinki city center is about 15-20 minutes / one way. 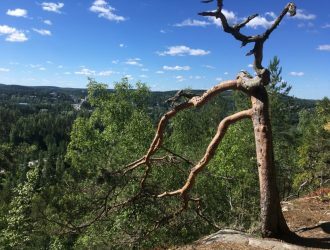 Bicycle: The bicycle route to Kauniainen follows closely to the car route. Public transport: Wherever you are located, have a look at train and bus connections from the Route Planner (Reittiopas in Finnish). It is only about 50 minutes total from Helsinki city centre including transfers to/from stops. Accessibility: The path is well covered and easy to walk. When to go: You can visit the lake area and the wonderful views around it any time of the year. You can also swim in the lake even though it’s quite shallow. Fishing: You can also fish in the lake: you can get pike and Crucian carp with apparently very little effort. Remember: according to Everyman’s rights in Finland, you are allowed to angle (simple fishing rod and line) without a fishing permit. However, if you want to use a reel and a lure, you must have a fishing permit. What to wear: No special clothes are required. a picnic by the lakeview. There are also some public piers so you can also jump in the lake for a swim. There is a protected swamp area called Träskmossen which used to be a part of the lake before it grew shut. How to get there: the address is Oppilaskodintie 5-7, and there is a path to the swamp area as well as duckboards that keep your feet dry.